We have a 32' HR (Monaco) Ambassador. It has a two-piece windshield. The windshields leak at the top intersection of the windshield pieces. It is not a major leak but I would like to prevent any water from getting inside. 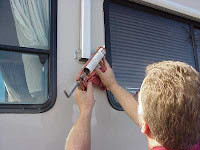 Could you give me the name of a windshield sealant to address a slight leak in the front windshield of our motorhome? What about silicone? Mike & Joanne H.
Silicone sealants are generally classified as acid-curing or moisture-curing. Acid-curing sealants are the most common as you’ll find them in the big box stores. However, these materials are considered somewhat low-performance. They're likely to not provide satisfactory results for the temperature extremes or weather that a typical motorhome may travel through. A better choice is a commercial-grade, moisture-curing silicone sealant, in a low to medium viscosity such as Dow 790. I’ve also had good luck with Permatex 81730 Flowable Silicone Windshield and Glass Sealer in most cases. In some rare instances, it is a little too runny. It all depends on the curvatures of the windshield and just where the leak is entering. I’d probably try the Permatex first and then look for the Dow 790 if it doesn’t work.